Many industrial applications require effective and reliable hydraulic power supplies, but high pressure applications bring an added dimension that demands specific design solutions. Oilgear has applied almost 100 years of design experience to deliver a range of solutions that incorporate innovation and flexibility. The process of product development is based on previous experience and applying new materials, technologies or theories to an existing product. In terms of high pressure applications Oilgear has a long-standing reputation for high quality and excellent levels of reliability. One of the key products in the high pressure arena is the PFCM range, a fixed displacement pump that offers long term reliability even when operating with low viscosity fluids. The PFCM pumps employ heavy-duty construction that has enabled many of these units to operate for over 40,000 hours before inspection and reconditioning is necessary. 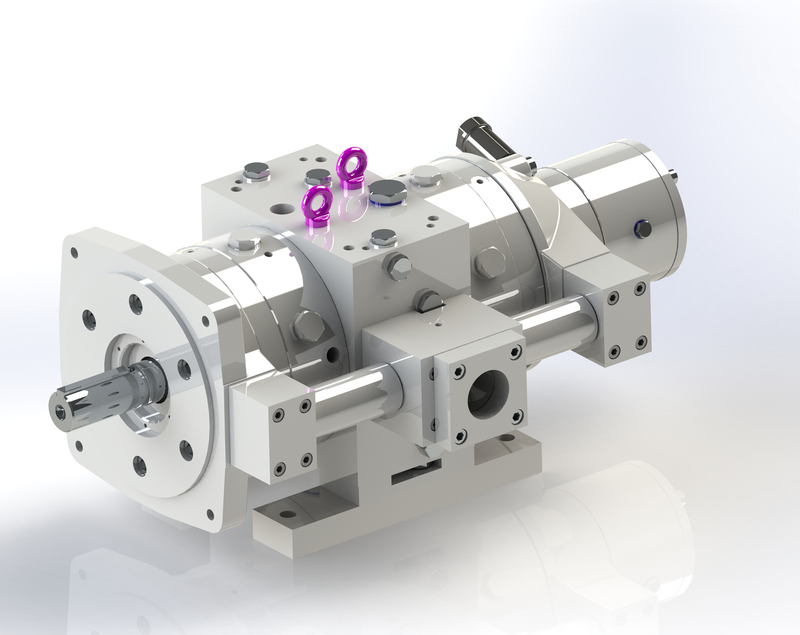 Designed to deliver high pressure supplies, up to 14,500 psi (1,000 bar) with most hydraulic fluids, this range of hydraulic pumps is well suited to a wide range of applications. The design of the PFCM range incorporates several design features developed by Oilgear such as the hydrodynamic thrust bearing with forced lubrication that carries the thrust load giving long life and also enabling operation with low viscosity or special fluids. This is coupled with the double-sided, counterbalanced swashblock with a balanced design that eliminates the need for thrust bearings and permits high rotational speeds as well as excellent reliability. In addition, the PFCM pumps use steel piston shoes to provide a hydrostatically balanced design that reduces piston shoe load and provides lubrication for increased life. They also provide a high degree of contamination wear resistance and again permit increased operation at higher pressures and increased flexibility with low viscosity or other special fluids. An increasing number of applications, especially in the marine sector, are using low viscosity, high water based fluids to minimise any pollution as well as reducing the risk of fire. Creating hydraulic pumps for the subsea market, which demands reliability on a par with the aerospace industry, requires a new design approach; especially when dealing with water-based fluids that offer very little in terms of natural lubrication. Minimizing the number of moving parts and using hard-on-hard technology, Oilgear uses proprietary technology to deliver some of the most durable hydraulic components on the market. The PFCM range is available in both single and double discharge configurations and is capable of producing up to 222 litres per minute (58.6 US gallons per minute). The flexible design has a through drive capability that allows additional pumps, up to 50 hp (37.3 KW) capacity, to be mounted if necessary. For nearly one hundred years Oilgear has been at the forefront of hydraulic engineering expertise and this has led to breakthroughs in hydraulic performance in some of the most hostile environments such as subsea oil and gas, aviation and mining. The PFCM range offers a solution for a wide variety of applications. For those involved in the operation of high pressure test rigs, civil and marine projects, intensifier systems, extrusion and forging presses and other heavy-duty metal forming machines, Oilgear can deliver a flexible and reliable solution. Photo Caption: The PFCM range offers a solution for a wide variety of applications. Oilgear is a leading manufacturer and supplier of fluid power and hydraulic equipment, servicing the Metals, Oil & Gas and Marine sectors, including both civil and military applications. Its solutions include high pressure pumps, valves and systems technology; panel building and systems control solutions; and full aftermarket service packages for all hydraulic solutions. Its Leeds based facility boasts a modern production area, which specialises in high pressure components, as well as in-house test beds and an R&D division which is responsible for developing customised software packages designed to monitor and control the installed systems.